Dayna Hoskin really knows how to bake up a storm. This recipe REALLY tested my patience, but after figuring out the fine details of, mainly, the meringue, I am amazed at how easy this dessert actually is! It's one that I've long admired in restaurants, it always seemed impossible to replicate at home, and after my first three events, I thought perhaps it was, but after making a few small changes to my method, here we have it. #1 Strapped for time, grab yourself pre-made sponge cake and custard from the supermarket. #2 For the sake of keeping your sponge soft and fluffy, a soft silicone spatula used in soft folding motions is the best way to use to minimise the amount of volume you lose while mixing your egg whites into your batter. If you don't have a silicone spatula, using the whisk in gentle sweeping motions is the next best thing! #3 Tin preparation for a sponge is slightly different to that for other cakes. You want to grease only the base of your cake tin, and then place a circle of parchment paper on top. The butter under the parchment paper will hold it in place and prevent it from slipping when you pour in your batter, and the exposed sides will allow your sponge cake to slightly grip the tin and climb up it, maximising the rise. #4 To get maximum volume out of your eggs, use room temperature egg whites and ensure there is no yolk mixed in with them, and that your beaters and bowl are clean and dry. Even a drop of water or oil can make a huge difference in the amount of volume you get out of your eggs. #5 Choose your ice-cream mould wisely. I had been using a ramekin of which has really harsh 'corners' and verticle sides. This made it harder for the meringue to hold on to the ice-cream and lead to it slipping off. Use a bowl so that your sides are sloped and there is no aggressive corners. #6 When cutting your meringue, ensure you use a hot knife. You can run it under hot water, the open flame of a gas cooktop or even a zippo lighter. A hot blade will cut throught he meringue and the ice-cream effortlessly so that you can serve a neat piece of Bombe Alaska. Does anything need to be said about this dish? It's delicious! Line a 9-inch baking tin with baking paper and set aside. Sift 1/3 cup plain flour and 1/4tsp baking powder into a small bowl, then re-sift. Place 25g butter in a small microwave-safe bowl and microwave for 50 seconds or until just melted. Place 4 eggs and 1/4 cup caster sugar in a small mixing bowl and mix on high speed with electric beaters until light in colour and almost quadrupled in size. Sift half the flour mixture into your eggs and fold together gently with a spatula. Sift in the rest of your flour and fold through until well combined. Add the melted butter to your mixture and gently mix through. Pour your batter out into your pre-prepared baking tray and place in the oven to bake for 15 minutes or until the top is golden and an inserted skewer is removed clean. Set aside to cool. Scoop vanilla ice cream into a large bowl lined with cling wrap. Add in 1/2 cup of white chocolate chips and mix thoroughly. Once mixed, press the ice-cream into the bowl so it fills all air pockets and scoop a small amount of ice-cream out of the centre (where your half a peach will go). Place the bowl in the freezer for 1 - 2 hours or until your ice-cream has re-frozen. Cut your peaches in half, pit them and remove the skin. Place face-down on a lightly oiled griddle pan over medium heat. Cook for 4 - 5 minutes or until grill marks appear of the peach, then flip them and cook for 4 - 5 minutes on the other side. Set aside. Place 4 eggs whites, 1 cup of caster sugar and a pinch of cream of tartar into a large glass or metal mixing bowl and place over a double boiler. (a medium sized saucepan containing a few inches of boiling water). Whisk by hand until all the sugar has dissolved. Move your mixing bowl off the double boiler and whisk with electric beaters until your mixture is thick, glossy and holds stiff peaks. This should take around 10 minutes or more depending on the power of your beaters. Retrieve your ice-cream cases from the freezer and set on the benchtop for 5 minutes to soften slightly. Gently remove your ice-cream mould from the bowl, press half a peach into the hole in the centre of the dome, them flip it (peach side down) onto your pre-prepared sponge cake. Using a sharp knife and your ice-cream mould as a guide, cut your sponge cake down to size so as it doesn't stick out past your ice-cream dome. Transfer your Bombe Alaska onto a spare plate or baking tray, and pipe or rusticly 'paint' your meringue mixture onto the outside of your ice-cream. Ensure you cover all the ice-cream and the sponge cake at the bottom, but you can make your layer as thick or as thin as you'd like, and any shape your desire! 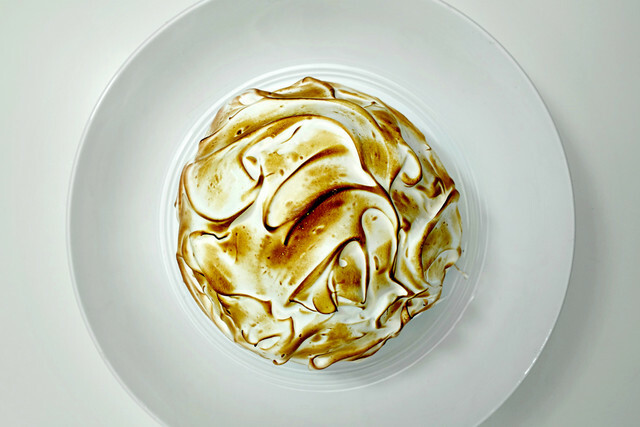 Transfer your Bombe Alaska onto your serving plate and gently toast your meringue with a blow torch. Serve right away. Place 1/2 a cup alcohol (must be over 80 proof liquor or 40% alcohol) into a saucepan and place over medium heat for 1 - 2 minutes to warm (do not boil). Move your Bombe Alaskas (if they're not already) into a bowl or onto a plate deep enough that the alcohol for the flambe won't overflow, then place 2 tablespoons of warmed alcohol into a small metal ladle, light with a long match or lighter and pour over your Bombe Alaska. Continue to pour over more alcohol (2tbsp at a time) until you're happy with the level of 'char' on your Bombe Alaska and serve. Pre-heat your oven to 200 degreed Celsius, place your Bombe Alaska in the oven for 10 - 15 minutes and serve. Copyright © 2018 HOSKINSHENS. All rights reserved. Reproduction in whole or in part without permission is prohibited. Click the 'yum' button below to save this recipe to your Yummly app. Be sure to send us a photo of your batch and let us know how ‘yummy’ it was! At Hoskins Hens, we bake what we love, and we love to bake. Hobby baker, chicken wrangler and passionate eater of all things sweet. | Coming to you from a humble half an acre in Australian suburbia. | If at first you don't succeed, feed it to the chooks and try again! Always read the entire recipe through before starting. Mise en Place - a French term meaning to gather your ingredients before you start! i need to take my own advice on this one. When baking, the ingredients should always start at room temperature. except when making pastries where chilled butter is preferred. When whipping egg whites, use room temperature egg whites, avoid silicone or plastic mixing bowls, and ensure that your beaters and bowl are clean and dry. except when baking desserts of Japanese origin, in this instance egg whites should be cold.